Yercaud is a mesmerising point of travel whenever you want to discover the beauty of the Eastern Ghats in its purest form. The mist, rain and the wet atmosphere are bound to leave you spellbound. Yercaud is a small hill station located in Tamil Nadu, and a road trip from the urban landscapes of Chennai to the picturesque landscape of Yercaud and the places that fall in between will definitely thrill you. Yercaud is located at an altitude of 4,970 feet above sea level. So grab a pair of woollens during your visit. 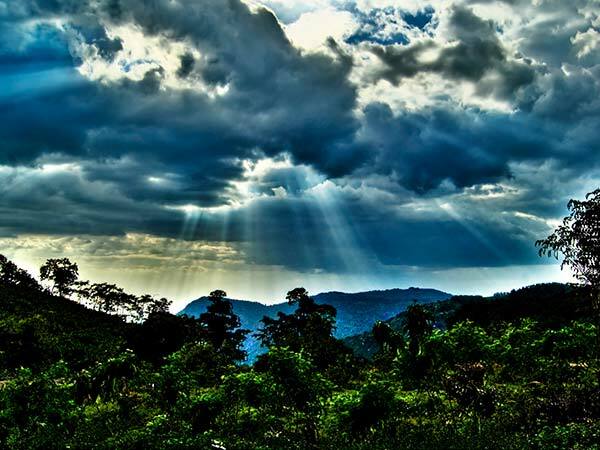 The best time to visit Yercaud is during the summer months between May and June. The temperature ranges from 16-30 degrees and thus, is a pleasant weather for a perfect romance with nature. When the monsoon subsides, autumn has a wonderful, lovely beginning but carry your jackets along as the nights can get cold. Yecaud is located amidst Shevaroy Hills nestled in between green lushly vegetations of the ghats. The distance between Chennai to Yercaud is roughly around 350-380 kilometres, depending on the route of travel. Route can be accessible through both rail and road but road is the most recommended one. You can take one of the following routes. The route via Krishnagiri is preferred as it gives the maximum opportunity for sightseeing and is a comfortable journey if you are riding a bike. The four-lane road makes it a smooth ride along the Eastern Ghats. On hitting the NH, make sure to fuel yourself with a good South Indian meal as there are a lot of local eateries along the highway. Krishnagiri is the next stop you will avail, which is about 250 km away and then comes Dharmapuri, which can be a preferred stop. From Dharmapuri, the road is headed towards Salem, which is just about 30 km from Yercaud. While travelling through route 2, your first halt should be Krishnagiri, which is about 259 km along the NH48. Krishnagiri is a wonderful place to visit. The majestic KRP Dam and the Krishnagiri Fort is a must on your list. In case you are searching for ultimate peace and devotion, you can visit Sri Kattu Veera Anjaneya Temple. Finding a food joint is not a big deal. There are places serving local dishes, like the Shree Mangalam Food Court and the Mangalam Restaurant. From Krishnagiri your next halt will be Dharmapuri, which is about a 45 km ride from your last stop. Located on the foothills of Vytla Hills, Dharmapuri is a silent place in nature secluded from its busy surroundings. The gorgeous Hogenakkal Falls is a must-visit here to get a glimpse of the majestic roaring and thunderous falls on the Kaveri river. Dharmapuri is a historical destination as it was the first district to be created in Tamil Nadu after Independence. Chenaraya Perumal Temple, located 7 km from your halt, is a magnificent example of Hoysala architecture dedicated to Lord Vishnu. From Dharmapuri your next halt can be at Salem, which a 63 km ride along the NH44. Salem is a busy place and is well known for its Hindu temples and the famous Jama Masjid, which shows a great lot of cultural diversity inhabiting there. Salem is a good shopping destination in case you are riding with your family. The local marketplaces, such as Bazaar Street and the Chinna Kadai Street, sell local items and have a lot to offer. Thattu vadai settu is the local delicacy quite popular there and is a similar form of chaat stuffed with beetroot, vegetables and carrot. About 30 km from Salem lies your final destination through the curvy mountain roads and damp, cool air. Yercaud rests silently surrounded by silver oaks and pepper vines and goes by the local name Yer-Cadu. Although it was a remote tribal destination earlier, it developed into a hilly attraction of the British later on, who introduced the Arabica coffee plantations along with citrus fruits in the area. Since then it has been known for its pleasant weather and the Catholic missionaries. Keeping your vehicle aside, from here it is advisable to stroll along the narrow pavements exploring the colonial architectural designs reflected in the convent buildings and the Holy Trinity Church that hold a British graveyard in its proximity. The names of some famous British generals on the graves give you a glimpse of the historical artefact stored in the silent valley. The Grange Bungalow located nearby takes the journey back to the first war of independence where it served as a seize point during the 1857 mutiny. No doubt of the beauty of this place, as it even cherished the eyes of Robert Clive who felt so homesick living here that he tried to shoot himself with a gun that later malfunctioned! A walk in the local market can fetch you delicacies like the corncob, the chilli bhajis and the honey-soaked sweet figs. Forget not to have a bite of custard apples available in plenty. Later on you can easily float around the lake in a pedalled boat finally resting your day. Do not forget to visit the Botanical Garden the very next day during the early morning hours as local birds and blooming flowers of kurinji can be a delight to the eyes. From here take a stroll around the muddy coffee plantation area and get yourself rejuvenated with the strong smell of coffee that perfectly works as a therapy; the area is definitely a halt you will never forget to visit again.